YEKATERINBURG, Russia — The emphasis on the team returning to the World Cup after 28 years has given way to attention on an individual player ahead of Egypt's World Cup opener against Uruguay. Liverpool star Mohamed Salah is expected to recover from a shoulder injury he sustained in the Champions League final in time to play at least some part of Egypt's World Cup campaign. But will he be fit to play Friday's opening game on the day he turns 26? Millions of Egyptians are anxious to know, and the intense interest isn't restricted to Egypt. The presence of the country's national hero is a key factor for his team's chances against Uruguay, and perhaps advancing from the group stage for the first time. Uruguay's World Cup experience and the depth of the squad make the South American team a favourite for the game and in Group A, which also host Russia and Saudi Arabia. The Russians meet the Saudi's in Thursday's tournament opener. Salah is a player who inspires and delivers for both his club and country. He scored 44 goals in all competitions in his debut season for Liverpool and became the leading scorer in the Premier League. His goals fired Egypt to the World Cup for the first time since 1990, earning Salah the deep gratitude of his nation and respect from rivals. 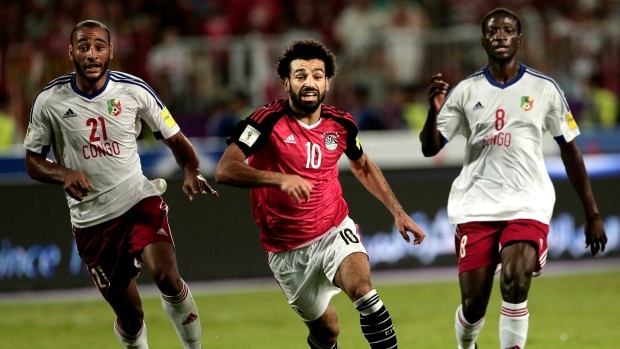 Salah scored five of Egypt's eight goals in the last round of Africa qualifying, including one from the spot in injury time against Congo that secured a spot in Russia with a game to spare. Without him, Egypt was struggling to find the back of the net in warmup games against Colombia (0-0) and Belgium (3-0). Salah showed clear signs of progress in his recovery Tuesday, dribbling the ball around the pitch and running at pace after working on his shoulder with a physiotherapist on the sidelines. "We are here after 28 years. We are happy about that, but every one of us has big ambitions and hopes," Salah told reporters in Grozny. Egypt goalkeeper Essam El Hadary may very well make history on Friday, when he's hoping to become the oldest player ever to play in a World Cup. But the 45-year-old El Hadary's spot is far from sure. He's vying for selection with Sherif Ekramy and Mohamed Elshenawy in what team officials say is a "heated but healthy and decent " competition to be top choice. Egypts defence, anchored by West Bromwich defenders Ahmed Hegazi and Ali Gabr, will be seriously tested by Uruguay's strike duo of Edinson Cavani and Luis Suarez. Cavani was in great shape for Paris Saint-Germain with 40 goals during the season and also had a tournament-leading 10 goals in South American qualifying — three more than the likes of Lionel Messi and Gabriel Jesus. He has 42 goals for Uruguay and poses a significant threat to the Egyptian defence. Suarez is also poised to perform on the sport's biggest stage, aiming to make a mark for his attacking prowess. At the 2010 World Cup, he was part of the squad that placed fourth but he was mostly remembered for his red card for handling a goal-bound header by Ghana's Dominic Adiyiah. Four years later, Suarez was expelled from the tournament in Brazil for biting Italy defender Giorgio Chiellini. Uruguay subsequently lost to Colombia in the round of 16. Coach Oscar Tabarez leads two-time champion Uruguay into his fourth World Cup, and third in a row. He was in charge in 1990 and again in 2010 and 2014. Tabarez's teams have always made it out of the group stage, including a semifinal appearance in South Africa in 2010. Nicknamed "El Maestro" (The Teacher), Tabarez brought the much needed discipline to Uruguay teams. Associated Press writer Hamza Hendawi contributed from Grozny, Russia.